This is what happened last weekend. A weekend of good weather in the Peak District was followed by an intermittently rainy weekend. After a couple of abortive attempts, Leo and I managed to get about two and a half hours of bouldering done on the Saturday before being rained off. On the Sunday we had a relaxed start while we waited for it to stop raining and were rewarded with a break in the rain for a while, but the rock was too wet to climb and we went for a potter along Curbar Edge instead. It was fun, but it was also a bit frustrating at times too and it would have been more fun if we had got a full weekend of climbing in. Leo climbing Route 2 (VB 4a) on The Chant section of Burbage North. Looking down the Burbage valley from Burbage North. At least, being a mainly limestone climber, I can just decide not to go at all if it’s wet! True. Limestone is not fun to climb on when it’s wet. The main issue for me is that I have limited opportunities to climb outside and most climbing is a bit of a trek to get to. It means that I have to try to make the most of the climbing opportunities I have. 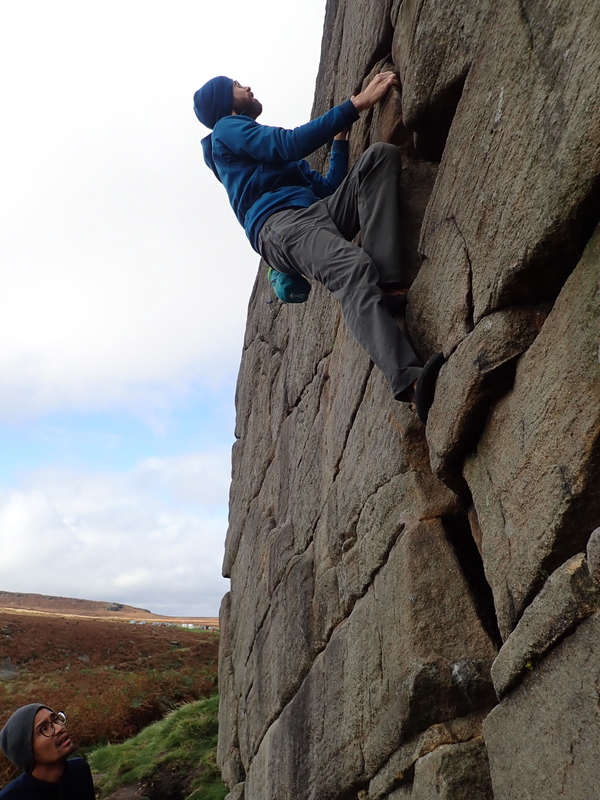 The bouldering is great in Burbage [North or South] as your pics show. There has been hardly any ‘best weather’ this last couple of months up here. But as I say that this morning is blue sky and sun – a bit of local gritstone this afternoon. I’m just lucky to have it on the doorstep. Maybe it’s just better weather I need. I dream of having climbing like that on my doorstep. You’re definitely lucky. Have a good climb this afternoon.